I’m now offering open air earthbag roundhouse designs with large arched doorways. This particular design was done for a client in a tropical climate where maximum ventilation is needed. Note: you could add doors, windows, covering over the stairs, etc. by ordering a custom plan. Please could you give me the price for the above roundhouse plans as I am very interested in building the above. Order a $200 roundhouse and specify the Open-air 33′ 2-story Roundhouse (leave a comment when ordering). Hi Owen, I love this design for my farm house. Do you think its suitable. If so is it possible for you to make it a three bedroomed one. I’m not longer doing custom plans. It takes too long over the Internet. You need an architect or engineer anyway, so might as well let them make the final changes. How do you attach beams to the exterior wall for the ceiling first floor to walk on the second floor? Do you have to custom build/weld brackets to slip over the top level of EB’s? On this design I would use one center beam with a post in the center. Then add floor joists that sit on the concrete bond beam and center beam. Embed metal anchors in the bond beam to secure the joists. In other words, it’s pretty much standard carpentry. An very nice design mr. Geiger! I am looking forward to buy one of these plans. Where i can see the low plant of this new round house design? Thank you. It’s easy to change things. 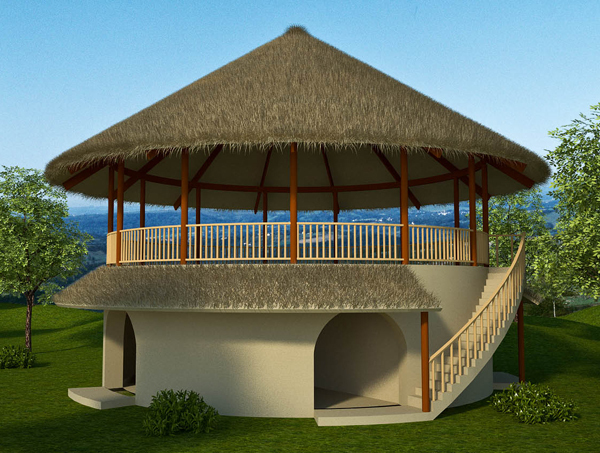 We love this design for our future homestead in Jamaica with a place to entertain upstairs. However, this design won’t work with the amount of hurricanes Jamaica is known for. We were thinking to build a reciprocal roof for the main house that will aid in our rain catchment system and have a lower deck out back (or to one side) for entertainment. such a good plan for those who need to cool! I just finished reading article on climate change, we are now beginning the slide to what will be next?! 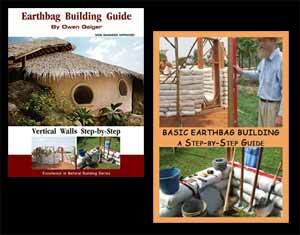 earthbag building, thanks for this plan!